We have great pleasure in presenting Cardigan Art Society, the winner of this year’s Art Club of the Year Award on pages 73 to 75 along with the five paintings that won the society the title. They were all painted by amateur members of the group, showing a wide range of styles, media and techniques that came together to create a coherent and well-balanced group of paintings. We are looking forward to launching the 2018 Art Club of the Year competition in our April issues (on sale 23 February) and online at PaintersOnline. 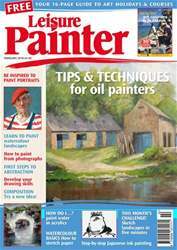 If you’re ready for your next challenge, turn to pages 12 and 13 for details on how to enter Leisure Painter’s 2018 Open Competition, which will culminate in our annual exhibition, launching at Patchings Festival this summer.